The bozzetti form part of a small but elegant exhibition about the Accademia's holdings of Canova. The exhibition runs until the end of August 2012 in the Accademia, Venice. Venice in Peril, the British fund that has worked over the last 50 years for the preservation of this incomparable city, is very pleased to have financed the conservation of these bozzetti by Canova. They are a suitable prelude to the Fund's much greater project, which is the conservation of the pyramidal monument to Canova in Sta Maria Gloriosa dei Frari. We have taken this on because the marble is rapidly degrading and action is urgently needed, but also because Canova was considered one of the greatest men of his time, with close ties to England. He was celebrated in the highest circles of society on his visit to London in 1815 and worked almost exclusively thereafter for English patrons until his death in 1822. The terracotta model is a reduced scale reproduction of a first century AD Roman copy of a celebrated Hellenistic sculpture. 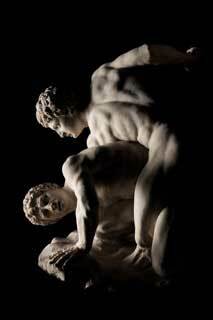 Since the 17th century the copy has been conserved in the Tribuna of the Uffizi in Florence but Canova studied the group from a plaster cast in the collection of the Venetian nobleman Filippo Farsetti (now of the Accademia Galleries, Venice). He submitted the model for an Academy of Fine Arts competition for a copy from antique statuary in 1775 and came second after Giuseppe Rampini. Wrestling was often used as a teaching subject throughout the 18th and 19th centuries because of the opportunities it offered for study of two bodies intertwined in complex poses. An entry in an Academy inventory of the 1830s records the piece as being in the “Stanza della Secreteria Lotta di due gladiatori, modellata con ispirito dall’Autore…lavoro di picciola mole in terracotta”. The two figures were built up gradually, with new material – light-coloured clay – being added as necessary; the group was cut up to facilitate the baking process and the parts were then reassembled and stuck together. Before its recent restoration the piece had been damaged in various ways over the years: chips and breakages had been carelessly repaired and the left arm of both wrestlers is missing, as is part of the base. The surface, patinated with a thin, light, oily wash, was dirty and stained. The conservation work entailed numerous operations to consolidate the terracotta; the right leg and foot of the upper figure were detached and remounted in the correct position; and the surface received a general clean and the more conspicuous stains were removed. Finally, the group was given a new base which fitted inside and reinforced the original. The model was purchased from Cesare Quintilliani in 1911 at the request of the director of the Accademia Galleries, Gino Fogolari, who wrote to the ministry explaining that “Canova is … spontaneous and vibrant when he casts the initial concept of his creations in clay; indeed, it could be said that we now find his models more interesting and appealing than his finished works” (A.S.S.P.M.V., Gallerie “Offerte e acquisti”, 113, 1911, 40.). Canova made the model in preparation for the large sculpture of the Pietà which he may have started to plan in 1817 at the invitation of Antoine Chrysostome Quatremère de Quincy, an architectural theorist and art critic and firm friend of the sculptor. The monumental sculpture was to be placed in the Church of Saint-Sulpice in Paris, a major example of Canova’s religious statuary and the first in France. Apart from the bozzetto seen here, there is another in the museum at Possagno, a smaller one in Rome and the original plaster model in Possagno as well as a number of contemporary plaster casts (including one in the Accademia Galleries). Marble and bronze versions of the Pietà were not made until after Canova’s death. This was perhaps the first of the series of preparatory models and seems, from the way the Virgin is bent over Christ’s face and from the two little angels, to be a development of a bas-relief which Canova made in Rome in 1800 (Possagno). The final version of the group (1821) seems to depict a slightly different moment in the drama; the angels are removed from the scene and Mary Magdalene, bowed in adoration of the body of Jesus, is added; the eyes of the Virgin, stunned by the sacrifice of the Saviour, are raised to Heaven, as in the striking altarpiece that Canova painted for the Parish Church of Possagno (now in the Temple). The bozzetto is made of pinkish clay and is extremely fragile; it was already in several pieces when the Accademia purchased it and invaluable photographic evidence from the 19th and early 20th centuries, when three of the angels’ wings were still in place, confirms that another two have since been lost. The recent restoration remedied various inaccurately executed earlier repairs and reattached several fragments before proceeding to a general cleaning of the surface to reveal the delicate, uniform colour of the terracotta. The wood and metal parts of the base were cleaned and re-varnished. One of two models purchased in 1821 at the instigation of the Commissione Accademica from the heirs of the Venetian architect Giannantonio Selva, a close friend of Canova, who had died two years before the sculptor. Together with another three in terracotta at Possagno, and with some sketches now in the Correr Museum, Venice, they represent Canova’s design for a monument to Titian, which one of the sculptor’s main patrons, Gerolamo Zulian, proposed in 1790. Zulian was a collector of Canova’s works and it was Selva who advised the nobleman how best to display them at his palazzo in Padua. The monument to Titian was to have been financed by a public subscription organized by the “lovers of fine arts” and installed in the Basilica of Santa Maria Gloriosa dei Frari. The death of Zulian in 1795 and the cost of the monument combined to ensure that the project never got any further. In 1792, however, the model in wood and wax must already have reached the stage where the figures moulded by the sculptor were completed and inserted, but before the piece was painted to look like marble: in that year Canova wrote to Selva to remind him that it was time the craftsmen who had constructed and worked on the finish of the model were paid. The chronology of the various models, i.e. the stages of development of this strikingly original commemorative monument, has been the subject of much discussion. In 1794, a public announcement inviting subscriptions gave a description of the monument: a pyramid – the sepulchral shape par excellence – the three sister arts, Painting, Sculpture and Architecture mourning the loss of Titian, the spirit of painting and finally a grief-stricken lion symbolizing the “Venetian School”. The specifications also included a portrait of Titian supported by two victory figures and a dedicatory inscription. This and the other model of the same subject in the Accademia have suffered serious losses of material but enough survives to confirm that they belong to the same stage in the development of the project. The position of the figures was the same in both: on the right, the inconsolable arts climb slowly towards the door; the lion lies across the other side and against him, lost in meditation, sits the winged spirit of painting. During the recent restoration of the model with wax figures it became possible to identify the original points of contact between the spirit and the lion and therefore to confirm that the position of the two figures was precisely that now seen on the monument dedicated to Canova in the Basilica dei Frari. Apollo, identified as such by the quiver full of arrows, is depicted coming to a sudden stop, a cry escaping his semi-parted lips. 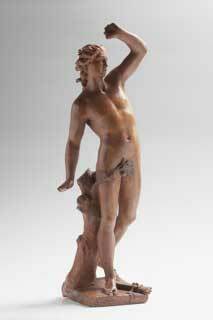 The stance suggests that the model was related to the Apollo and Daphne group commissioned by the procuratore Ludovico Rezzonico on which Canova was working in 1777-1778; as Fausto Tadini recalls in his 1796 memoir, the two statues were “no more than roughed out” in soft Vicenza stone when Rezzonico’s death caused the project to be abandoned. There is no record of the pose adopted by the nymph as she is about to be transformed into a tree to escape the attentions of the god. Canova himself donated the model to the Academy in 1776, at the same time as he was admitted to membership: the figure is finished to a degree that suggests that the sculptor may have used it to present his concept for the statue to Rezzonico. Its flowing elegance and the smoothness of the anatomy reveals the young sculptor’s debt to the best of mid-18th century Venetian statuary as that of Giovanni Marchiori or Antonio Gai, but the pose and the expression are strongly reminiscent of the Apollo e Dafne by Gianlorenzo Bernini, a plaster cast of which Canova could have studied in the Farsetti collection in Venice. The model was first fashioned whole in light orange clay and then separated into sections for baking. The terracotta pieces were then fitted back together with the aid of boxwood dowelling. The piece has suffered several breakages over the years and after each repair a clear wax or coloured patina was applied. The recent restoration work included detaching and remounting loose or badly reassembled parts (such as the head) and general cleaning, especially of the thick layers of wax infill on the legs, in the hair and in the supporting tree trunk. The restoration of the wood and wax model involved the disinfestation, renewal and consolidation of the wooden structure, with wedge-shaped inserts in the joints and reinforcements. The paint was consolidated, cleaned and retouched where necessary. The wax figures were first cleaned and then recomposed, the joints being filled and retouched to harmonize them with the rest of the figure; finally careful studies were carried out to identify their correct position on the model. There can be no doubt that from its refoundation by imperial-royal decree on 12th February 1807, the new Academy of Fine Arts of Venice took as its guiding lights the two greatest figures in Venetian art; the old master Titian and the contemporary genius Canova. Under the assiduous and wise leadership of Leopoldo Cicognara, its president from 1808, the confraternity of artists devoted to the sacred task of preserving by practising the uninterrupted tradition of Venetian art transformed itself into a teaching institution fully capable of addressing the problem of how to deal with the cultural and artistic identity inherited from the Republic, how to conserve it and how to exploit it to create a contemporary figurative idiom. Pride of place in the main room of the new Academy Galleries, beneath the great gilded ceiling of the chapterhouse of the Scuola Grande della Carità, went to Titian’s epoch-marking masterpiece, The Assumption, from the Basilica dei Frari, the highest achievement of the artistic history of the lagoon area. If the pupils of the Academy had to measure themselves against that history, Titian’s altarpiece was the ineluctable benchmark. At the same time, in the room devoted to statuary, the models, preparatory studies and great plaster casts of finished works by Canova, often donated by the sculptor himself to be used for teaching purposes, constituted a reassuring source of support that lent indisputable authority – also at an international level – to the Academy’s mission to relate to the contemporary world. Our plans for the future, expanded Accademia Galleries include various ways of protecting the memory of the institution’s past, including a room dedicated to Canova. This will contain a substantial number of important pieces, reordered for the occasion and in part restored over the last few years under the expert supervision of Enrico Noè. Taking further steps in this direction, we have been able to commission the restoration of models and preparatory studies in the collection thanks to generous private support, in particular of The Venice in Peril Fund, the British organization working in the framework of the UNESCO-Private Committees Programme for the Safeguarding of Venice. Venice in Peril is currently engaged too in financing a much bigger and more complex “Canovian” project, the restoration of the sculptor’s cenotaph in the Basilica dei Frari. Another piece now undergoing complex restoration at the Misericordia – the Superintendency of State Museums’ interdisciplinary restoration laboratory – is the elegant urn designed by Giuseppe Borsato to contain Canova’s right hand; this too will be restored to public view in the new, expanded Galleries. And finally, work will begin soon on the restoration of important plaster casts of works by Canova, including the monumental Pietà. The main focus of this temporary exhibition and an important component of the future Canova Room, is the two models of the monument that Canova designed to honour the memory of Titian. Purchased for the Academy from the heirs of Giannantonio Selva, an architect, professor of architecture and close friend of the sculptor, they offer a striking visual and conceptual insight into a complex historical episode. The fact that they are now together again, after over a century during which one was in store at the Correr Museum, is a testimony to the sensitive support our civic museum colleagues have lent to our plans. The story of this unfulfilled project becomes almost achingly poignant when one thinks how ambitious and brilliant it was, an idea conceived when the Republic was no longer in a position either to bear the expense or, perhaps, to rise to the cultural and moral challenge it represented.